With a long and illustrious history in China, wushu sport is poised to be inducted into the 2008 Beijing Olympic Games. If it is selected, it will have come a long way from its humble beginnings in China to becoming a world class competitive sport. Coach of the United States Wushu Team, Dao-yun Chen says that wushu is an ancient Chinese art rooted in tradition. 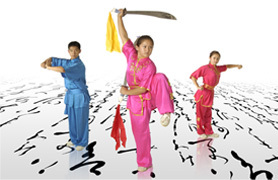 There are official wushu teams for every city in China and local schools are even more numerous. Wushu is a national sport for China, much as tae kown do for Korea, basketball for the United States, or soccer for Brazil. Wushu, in a way, represents the soul of China. It is deeply rooted in spirituality and philosophy. In America, wushu is still associated with old martial arts films of the early 60s. It is synonymous with ruffians, and big muscular men. But as a sport, wushu is actually quite scientific, making use of physiology and body dynamics by challenging the potentials of the human body. Students must be steadfast and thorough. By current international competition standards, a “taolu” or routine lasts a mere 1 minute and 20 seconds, yet must include 50 to 60 highly difficult technical movements. Being a wushu coach for more than 30 years, Dao-yun Chen feels that controlling the open stances, timing, movement, technique, rhythm and atmosphere are the key to winning. “A good wushu athlete’s performance can evoke a timeless feeling. Every movement captures the attention of its audience, highlighting its creativity and explosiveness.” From her description, wushu is likened to a fine work of art, when at its highest level, expresses an utmost profound meaning. Many people do not understand the difference between modern wushu and traditional kung fu. In the US, competitions using routines formalized by international standards are termed wushu. In China, wushu has a far wider meaning, including of all forms of combative arts. Modern wushu stylizes the techniques of traditional kung fu turning it into a performance-oriented series of precision movements. Wushu was originally developed as a way of self-defense, such as the forms developed by the Shaolin Monks to repel invaders. With the progress of human culture and civilized society, self-defense has become almost innate. "As our lives grow more stable and peaceful, the aim of wushu has transitioned from self-defense to health and well being. As the world becomes more complex, wushu helps maintain a centered and balanced mind and body. With the current technology boom, an increasing number of people work in environments that force them to sit for long hours without moving. This potentially damaging condition can easily be alleviated by a brief and invigorating wushu work out in the park. " Chen says, In this way, wushu can truly transcend its artistic and competitive qualities to become a value to the individual, helping them reach the next level in their development. Chen teaches that there are 3 stages to reaching the ultimate level in wushu training. First, practice and persistence are essential. As long as a student is willing to train hard with the aid of scientific practices, and involve wushu into their daily lives, the rewards are limitless. Next is the importance of a strong foundation. A wushu athlete’s basic foundation is like that of a well built house, able to withstand the test of time. There are no shortcuts to success, only by building a strong foundation will students be able to move on to the next level. Coach Chen points out that, “Jet Li’s incredible wushu skills comes from his more than 10 years of diligent practice.” Lastly, students must posses a natural understanding of their abilities. Every person is different and has varying levels of potential. Some are naturals at mimicry, while others excel at performance. Those wishing to be the best must also know how to work hard. Refining natural abilities along with diligent training and a willingness to learn will bring the ultimate success.